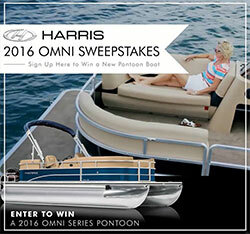 Harris Boats is in the midst of one of its biggest promotions ever — a sweepstakes drawing for a 2016 Harris Omni 200 pontoon boat. The Harris’ Omni 200 is known for its reliability, style and performance. It’s the perfect entry-level pontoon for romantic outings, entertaining family and friends, fishing, watersports or simple cruising on the open waters. The prize boat comes equipped with a Mercury 50 ELPT outboard engine and has a retail value of $20,215. To enter the drawing, just fill out the online entry form or visit a sponsor kiosk at trade shows and retail stores featuring Harris Boats. Participants must enter before June 30, 2016, and be a United States citizen age 18 or older. No purchase is necessary to win, but entrants must provide their full name, valid email address, telephone number and mailing address, and consent to allow Harris and its partner companies permission to send product information and other promotions. Harris will not share entry information with third parties. Only one entry is allowed per person. Good luck!